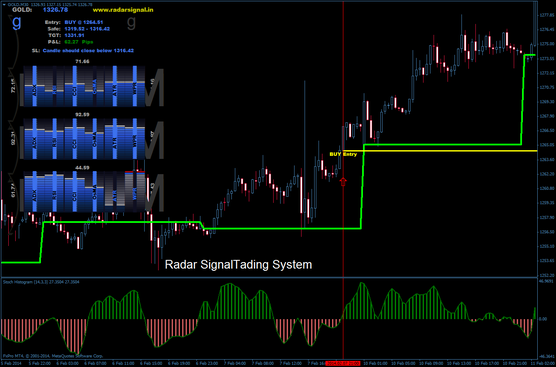 Radar Signal trading system is a forex strategy trend following breakout. It's base on the radar signal indicator. Time Frame 30 min or 60 min . Currency pairs:EUR/USD, GBP/USD, AUD/USD, USD/CHF/ GPB/JPY, EUR/ JPY, US/NZ, and exotic currency pairs. Indicies: S&P 500, Dax, FTSE. Stochastic histogram ( 14, 3,3,). Radar signal indicator indicates a pending buy order. Placed order, if Stochastic histogram is green and the price is above the daily open line. Radar signal indicator indicates a pending sell order. Placed order, if Stochastic histogram is red and the price is below the daily open line. At the profit target indicate by radar signal indicator or fast profit target that depends by currency pairs. Initial stop loss 30-40 pips. 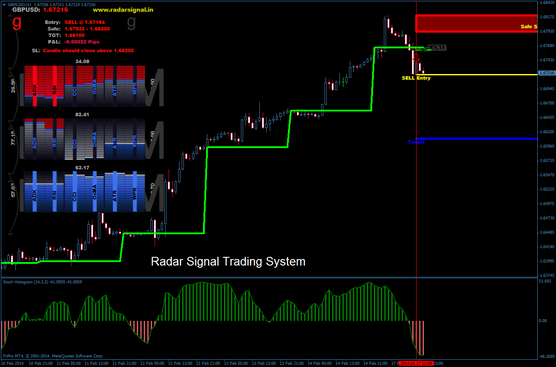 In the pictures Radar Signal trading system in action. VERY NICE TRADING SYSTEM AND PLEASE HOW TO SELL OR CALL SIGNAL POINT..
Good day. Thank you so much for downloading your indicators and systems. Once again, thank you. how do u open a rar file guys please help? I check the system. It's amazing. Lets see full week how it is!